Wearing a fitness tracker can change your life. You will never want to take off a fitness tracker that is effective, stylish, and comfortable. As the time goes, tracking your sleep, activities, and heart health will become your second nature. This habit is very beneficial, as it helps you monitor your health and fitness to reach effective goals. If you are currently looking for a cool and stylish fitness tracker and you can’t care less about having a bulky display screen, then Jawbone UP24 and Jawbone UP 3 are certainly attractive choices. Without any display screen, these fitness trackers are slim and sleek, ready to keep you in shape and in style. So, should you pick Jawbone UP 24 or Jawbone UP 3? Even tough both devices have been designed to be simple and minimalistic, they have quite different designs. Jawbone UP24 is extremely simple. The band is simply a thin elastic piece that circles around in a loop. The end goes over the other end, which features the Jawbone logo carved on a metallic plate. Such design allows you to wear and un-wear the device very quickly and effortlessly. The outer surface is textured with stripes. 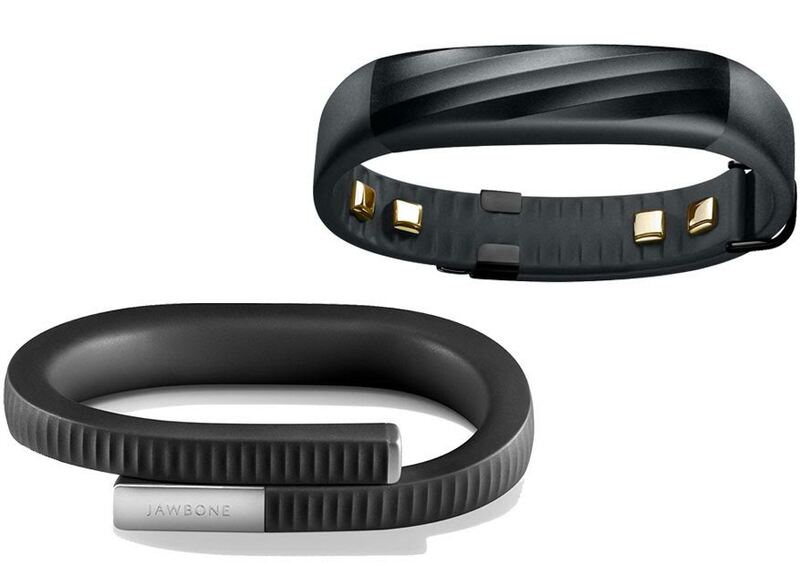 On the other hand, Jawbone UP 3 appears more elegant with a textured gloss top and clasp mechanism. The glossy top is actually for tap control for switching modes. It is also very easy to wear, though maybe not as practical as the slip-in design of Jawbone UP24. Both models are available in various colors, such as Onyx, Lemon Lime, Orange, Blue, Ruby Cross, and Silver Cross. Both are water-resistant, so you don’t need to worry about sweating and rain. Both models have built-in sensors to track your fitness levels. They integrate wirelessly with your smartphone, in which the respective apps should be installed. Take a note that they work with different apps. Jawbone UP24 works with the blue UP app, whereas Jawbone UP 3 works with the purple UP app. They connect via Bluetooth. The Bluetooth connectivity is always active and cannot be turned off. Each has a built-in rechargeable battery. Jawbone UP24 offers a respectable battery life of up to 14 days, whereas Jawbone UP 3 can only last for up to 7 days. Still, staying on continuously for a full week is still a nice feat. Interestingly, these models have slightly different features. Jawbone UP 3 has added more heart rate monitoring features, including the ability to track your resting heart rate during sleeping. But Jawbone UP 3 is missing the Power Nap mode, which is available on Jawbone UP24. The Power Nap is great if you want to get some rest during the day without drifting into deep sleep. If you want to get the heart rate monitoring features, then Jawbone UP 3 is the way to go. Of course, it is also more stylish and classy. However, for the practicality and features, Jawbone UP24 is better. The Power Nap mode is very useful.